Michelle Carter on a brief return to Roosevelt Island, a different version of her recent fate to share. Last October, following up on a report in the New York Daily News, I spent hours tracking down Michelle Carter, a quadriplegic who the News said had been robbed of millions by the owners of a local business. I wasn't successful, but yesterday, there she was, sitting peacefully beside the up escalator in the Roosevelt Island subway station. Before publishing our report, I exchanged notes with the Daily News reporter and agreed to try finding Carter to get her side of the story. Would she confirm it as reported, even add some details? Restricted by staffing cutbacks, the Daily News could not spring anyone free to walk the area around 34th Street and Penn Station where Carter was known to hang out, broke now, wandering among commuters all day, sleeping in homeless shelters by night. Going up and down 34th Street, in and out of Penn Station, searching for as long as I could, I never caught even a glimpse of the woman I'd known for ten years, a resident notorious for aggressive panhandling outside Gristedes and the subway station, with whom I'd chatted many times. The closest I got was when a National Guardsman patrolling Penn Station told me he'd seen her heading into the Seventh Avenue Subway, twenty minutes before. "No way I was going to try finding you in the subway," I told her. "Nooo," Carter, whose been known to ramble the system for hours at a time, laughed. Having long abandoned efforts to find her and circle back with my colleague, I walked right by Michelle Carter, looking for a bus to carry us home on a cold and windy Sunday afternoon. But once we settled in for a wait, I looked back, and there she was. We'd talked many times in the past, although not in a few years, and it was a relief to find her as friendly and outgoing as ever. I asked her if I could give her a dollar. It was an old routine. We'd done it before. Why make her ask when I knew what she wanted? 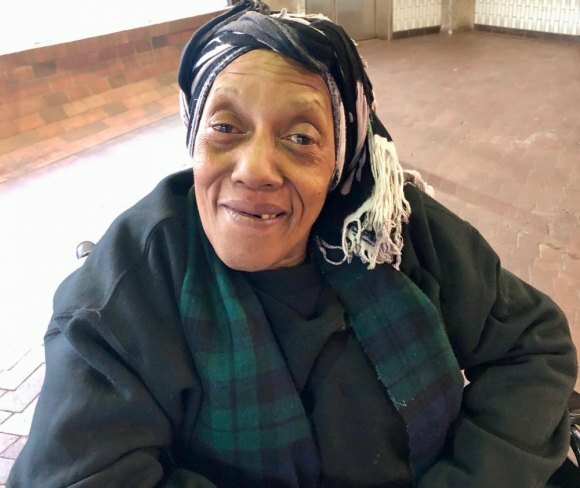 Of course, I knew giving her money encouraged her to keep begging, but when I considered the circumstances of her life, confined to a wheelchair and God only knows what medical needs, my dollar never seemed like much. I made her smile. It was worth it. Yesterday, she smiled again. Then, when I asked permission to take a picture, she joked about having lost too many teeth. After telling her about my afternoon searching for her, back in October, I asked about the story itself, the news that deli owners had soaked up hundreds of thousands from her in a con. Surprisingly, she did not agree with that version. "No." She shook her head. "It was my relatives." Carter explained that her first attorney gave her unspecified relatives access to her windfall, a $3 million settlement from being run over by a train in the Roosevelt Island station. Instead of safekeeping, they stole it. For several reasons, this didn't jibe with reality nor with the elaborate story the Queens District Attorney laid out. Her relatives and her first attorney were responsible. She didn't even acknowledge the Bible in her backpack, the folksy twist that made the story more poignant and real. Then, abruptly, it was time for her to go. Off she rolled, mumbling an aside I couldn't understand, for the elevator down to the subway platform. She paused to try on a cap someone left on a shelf but decided against keeping it before disappearing behind the closing doors. It was nice to have seen her again and to have talked for a few minutes, but it was baffling as well. Unlike the resolution I expected, I got more puzzled. Can there be two so different realities out there? Where does the truth lie? Maybe I'll ask Michelle Carter, the next time I find her wheeling through the system, if there's enough time before impulse takes her away.